Milenio Foundation: The Gran Chaco plant: another Karachipampa? Bolivian Thoughts opinion: We have the benefit to count with superb institutions like Milenio Foundation, its sound analysis gives light to what is going on with our country. Karachipampa smelter in Potosi is what we call a white-elephant project, ill designed with basic limitations to be efficient and competitive. The Gran Chaco plant: another Karachipampa? According to press reports, the Gran Chaco liquid separation plant “Carlos Villegas” operates with less than 30% of its LPG production capacity. This happens two years after its operation, in September 2015, and there are no certain conditions for an increase in the volume of its operations. The main reason would be the lack of export markets, together with the shortage of natural gas, whose production has been falling since 2015. It must be remembered that this plant was created to recover the liquefiers of the gas export current to Argentina -as in the case of the separating plant of Rio Grande, with respect to the gas exported to Brazil-, and also to obtain raw materials for the polymer petrochemical project. The Gran Chaco plant has a processing capacity of 32.19 MMM3D (millions of cubic meters of gas per day), almost 6 times more than the Rio Grande plant, being one of the largest in South America, and has been designed to produce 2,247 Ton/Day of LPG, 3,144 Ton/Day of ethane, 1,044 barrels per day of isopentane and 1,658 barrels per day of natural gasoline. The estimated investment in its construction and commissioning would reach 690 million dollars. According to the plans of YPFB, the production of Gran Chaco propane would be used for a future polypropylene plant, and the production of ethane for another polyethylene plant. While these two projects were being carried out, it was planned to export large quantities of LPG to neighboring countries. But such expectations have not been met. The polyethylene plant is postponed, the same as the polypropylene plant, and perhaps definitely. From the initial Gran Chaco project, what remains is the production of LPG. YPFB announced the intention to export 82% of the LPG produced, and to allocate the remaining part for the domestic market. However, and as noted above, the state oil company has many difficulties to place LPG production both in the local market and in neighboring markets. Considering the INE data, between 2014 and 2015, the value of the LPG export fell by 54.3%, from US $27.28 MM to US $12.47 MM, due to lower exported volumes; a trend that seems to have continued in the following two years. The concrete fact is that the operation of the Rio Grande plant could be sufficient to reach these volumes. In fact, LPG exports to Peru have been made with the production of the Rio Grande plant, as well as to Uruguay, with which the only export market for LPG at the Gran Chaco plant is Paraguay. For the expert Hugo del Granado, one of the difficulties of the Gran Chaco plant is related to the export routes of the products obtained (gasoline, LPG or ethylene), which are liquid, and for which ducts would have to be built, to Argentina or to the Pacific. It would be very complicated to load more than 120 cisterns of 30 cubic meters of LPG, every day. The plant does not have a pipeline to transport LPG or the gasoline to be produced. It also does not have loading sleeves or railway branches that allow loading and dispatch in wagons. This type of failure would be a blunder because the Yacuiba-Santa Cruz FFCC practically passes through the plant’s door. If the liquids were converted into polypropylene or polyethylenes, which are solid, and taking into account that more than one million tons/year of these polymers would be produced, and given that Argentina does not have the capacity to absorb all this production, it would have to be think of export routes to overseas, which has not been contemplated in the projects. Added to all this, is the non-completion of the agreement sought by YPFB with the Refinor company, which sells fuels in northern Argentina, which had expressed interest in buying a significant amount of Bolivian LPG. Another factor involved in the breakdown of the low production of LPG at the Gran Chaco separating plant has to do with the persistent fall in natural gas production volumes. As can be observed in the previous graph, in two successive years (2015 and 2016) there has been a negative growth in the production of natural gas, which shows an almost structural restriction to the viability of the projects that have as raw material the extraction of liquefiable gases from the exportable gas stream to Argentina. 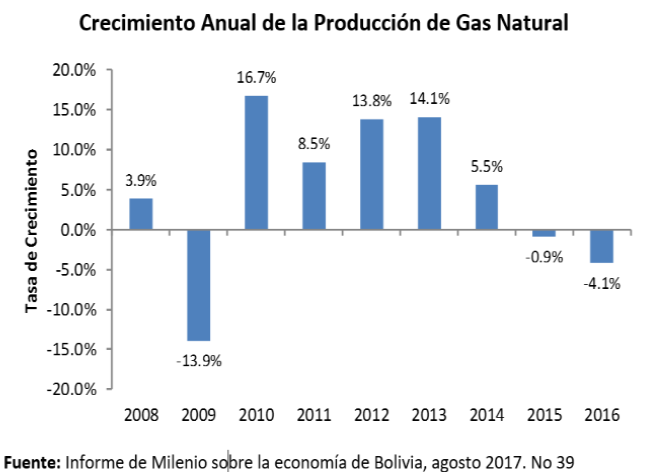 This is what the study by Hugo del Granado has shown, warning of a deficit in the supply of gas as an obstacle to the materialization of said projects. Already, in 2017, a drop in gas production is again registered. According to information from the Ministry of Hydrocarbons, the first quarter of this year reflects a fall of 3% compared to the same period in 2016, which was 56.83 MMm3d, compared to an average of 55.17 MMm3d in 2017. Thus, a production deficit of more or less 12 MMm3d is necessary to satisfy the maximum demands of the domestic and export markets simultaneously. This deficit arises from adding 24 MMm3d for Argentina, with 30 MMm3d for Brazil, and 13 MMm3d for domestic consumption, which makes a total of 67 MMm3d of maximum potential demand, while the current supply is around 55 MMm3d. The explanation of this decreasing trend in gas production is in the decline of the fields of exploitation and in the lack of replacement of gas reserves. 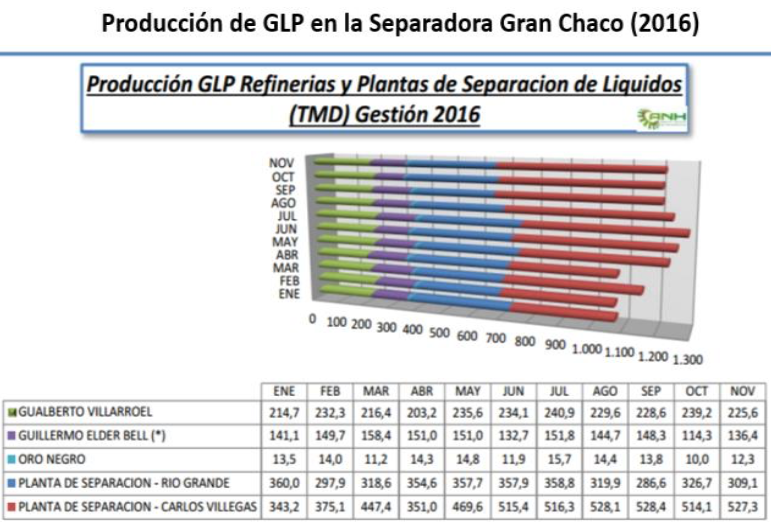 All these data, on the other hand, corroborate the observation of Hugo del Granado that the design of the Gran Chaco plant has incurred the error of not contemplating adding value to LPG, separating propane from butane. This is due to the fact that the polypropylene plant only uses propane as a raw material and that butane has a higher price than propane and that the same LPG, so that its commercialization could in itself lead to good business. The usual thing in the world of industrial engineering is that plants of the type of Gran Chaco separator, large, and huge investments, are designed and installed by sequential modules, which are added according to the availability of raw materials and the existence of markets for the products, and in such a way that the plants have greater flexibility to develop their operations and their maintenance. But this is not how it was done in the case of the Gran Chaco plant. Rather, it seems to have been done the other way around: first the facilities were built, lacking the necessary studies of market and feasibility, so that they only now run into problems, such as the absence of export markets or the scarce availability of gas o and the lack of infrastructure to evacuate their production. Certainly there is no correspondence of the financial effort (around 700 million dollars) that this elephantine project supposes for the country, with the modest expertise of its executors and decision makers. It seems that is the chronicle of an announced failure.